St. Matthias Cemetery is located directly south of and adjacent to St. Matthias Episcopal Church. According to GPS-derived geolocation (accurate to within 10 meters), the cemetery's coordinates are 39°05'51.5"N and 104°49'49.0"W. The cemetery is reached by taking the Monument exit (161) off Interstate 25 and traveling east on Highway 105 approximately three miles. The cemetery is about 1.5 miles north of the intersection of Highway 105 and Furrow Road on the west side of the road. The sexton records are maintained at the church at (719) 481-3998. 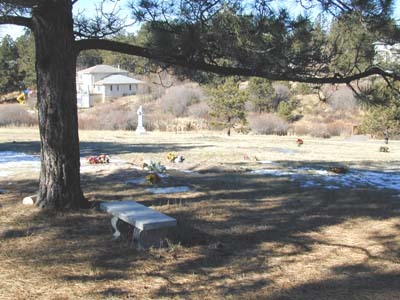 Initial planning for the cemetery began in 1975, with county approval in 1977. The first burial took place in 1977. The cemetery is located in a forested area and is maintained by St. Matthias Episcopal Church. The cemetery consists of 38 sections with between four and 24 plots per section. A statue of St. Francis is located on the grounds.